Phantasy Star Online 2 The Animation - Matoi "Tony ver." From the popular Online RPG Game Phantasy Star Online 2 by Sega comes the main heroine, Matoi! Kotobukiya's next Ani Statue is of Matoi based on the illustration (by the famous Japanese illustrator Tony!) as seen after the end credit of the anime. Sculpted by the talented Yuzo, who sculpted many Kotobukiya figures including the Tony's Heroine Collection series! Strictly supervised by Sega, this is truly a masterpiece of Kotobukiya's 4-Leaves bishoujo figure series! Matoi stands at around 27cm tall (1/6 scale), balancing on one leg as her gradient silver hair curls gently around her. Perfect for fans of Phantasy Star Online and Tony! 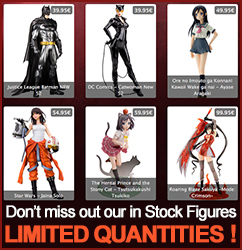 Display alone or alongside other Kotobukiya bishoujo figures!